We've had 3 books nominated in the MG/YA nonfiction category that deal with Civil Rights, and they're all pretty awesome. Here's a book that deserves every drop of hype. This is how children's nonfiction should be done! A story written at level without being dumbed down (bonus points for being about a young person), beautiful book design with with great pictures, good informational sidebars, and excellent back matter. Not only are all the sources listed with a good index, but there is an excellent author's note about how the book came to be. The only thing one could want is a specific list of further reading at the same level as the book. Claudette Colvin cuts through many myths of the Montgomery Bus Boycotts. I grew up learning that Rosa Parks was the first person to refuse to give up her seat and go to jail for it. That she did it because she was tired after a long day of work. Later I learned that it turns out that Rosa Parks wasn't an accidental hero, but a badass deliberate one. She was very involved in the civil rights movement in Montgomery and was tired not from a long day, but tired from a life of being a second class citizen. Then I learned that Rosa Parks wasn't the first, but the other two women were unsuitable. One was a pregnant teen. The other was equally as bad. I really appreciated how the text alternates between Hoose's history and Colvin's memories, with the two working as duel narrators. Overall, an inspiring story that is told very well and beautifully pacakged. An excellent example of what children's nonfiction should look like. I cannot say enough good things about this one. How is this for an amazing first sentence? The first time Joanne Blackmon was arrested, she was just ten years old. The opening photograph is of a young boy being arrested for protesting the lack of voting rights for black citizens in Alabama. The story just goes from there, telling the story of the voting rights struggle, particularly the 1965 march from Selma to Montgomery, through the eyes of the children. You really get the sense that this was a children's movement. The children didn't fear losing their jobs. No one was depending on them to put food on the table. They could fill the jails day after day. The cut class and marched and organized and tried to change their lives and their future. They faced horrific violence and they won. This is a perfect pairing with Claudette Colvin: Twice Toward Justice. This one's even more beautiful. The book really uses photography well and the result is visually stunning. The back matter also has a great additional reading list and more information on the author's webpage. 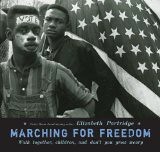 Every January and February, I'm scrambling to find interesting books to show the kids at work about the Civil Rights movement. These two show what kids just like them did to change their world in a way that is truly inspiring. Ok, this one isn't as pretty or inspiring as the other two, but it's really fun. Each chapter is a different story in the Civil Rights movement. There's a general introduction and conclusion and then in between? It's history. CHOOSE YOUR OWN ADVENTURE style. No, I'm not kidding. You can be a white adult in Little Rock during integration. Do you help guard the students walking into school? Or do you join the crowds jeering them? Or do you just stay home? You can be a college student. Do you join a sit-in? Are you a freedom rider? Which bus do you get on? When attacked, do you run or help you injured friends? You can be a black child in Birmingham. Do you march or stay home? At church on Sunday, do you go outside for air or go down to the basement to see if your friends are there? Interspersed are photos and real events. It's another one for excellent back matter. This is one for your kids you don't want to read about history or Civil Rights. A great pick for a reluctant reader. Nonfiction Monday Round up is over at The Book Nosher. Great write up about Claudette Colvin. I heard about it a couple of weeks ago when Hoose won the National Book Award, and after reading your review it's on my "to buy" list. The other books sound like great supplemental reads too. Thanks!